27-year-old Marcus Stoinis almost single-handedly lifted Australia to victory, scoring 146 not out off 117 balls batting at No.7. File Photo of the New Zealand Team. AUCKLAND: New Zealand overcame one of the greatest all-round performances in one-day cricket history by Australian rookie Marcus Stoinis to win the first match of the Chappell-Hadlee series on Monday by a threadbare six runs. Playing in only his second ODI, 16 months after his first, the 27-year-old Stoinis almost single-handedly lifted Australia to victory, scoring 146 not out off 117 balls batting at No.7, and taking three vital wickets for 49 runs. Stoinis came to the wicket with Australia 54-5 in the 13th over chasing New Zealand's 286-9. He batted through the next 34 overs, dominating five partnerships to spur his team to the brink of victory. His unbeaten total was the highest by an Australian batting at No. 7 in a one-day interational. Foregoing singles and even twos, Stoinis resolved to hit Australia home with fours and sixes on the short boundaries at Eden Park and, after hitting nine fours and 11 sixes, he had come within one shot of tying the game when his last batting partner was lost. Australia's cause looked lost at 226-9 after 44 overs, but Stoinis then put on a remarkable 54-run last wicket stand in four overs with paceman Josh Hazlewood, who did not face a ball in the entire partnership. Australia needed seven runs to win with a comfortable three overs in hand, but their hopes ended then when Hazlewood was run-out at the non-striker's end by New Zealand captain Kane Williamson. Hazlewood had been at the crease for 26 minutes for 0 when he backed up too far and saw his wicket thrown down to end the visitors' near-miraculous chase for victory. Australia seemed to have no hope when they crashed to 54-5, then 67-6 in pursuit of New Zealand's moderate total. But Stoinis rallied the tail and put on partnerships of 81 for the seventh wicket with James Faulkner (25), 48 for the eighth with Pat Cummins (36) and 30 for the ninth with Mitchell Starc (3) before Hazelwood joined him. It was a bitter blow for Stoinis when his heroic rearguard action ended with the victory he deserved so close at hand. "I feel a little bit damp to be honest," Stoinis said. "I know it's something I should enjoy and maybe it will sink in a little bit later. But the win was the No. 1 priority and there were a few sad faces in the dressing room. "I think the key was not to panic. Your first instinct is to try and score a bit quicker but I think you've got to chill out, get used to the conditions and figure out what's going on." Stoinis said his partnership with Faulkner helped him realize the match could still be won. He knew if Australia could take the game deep, it was possible at Eden Park to chase down any total. 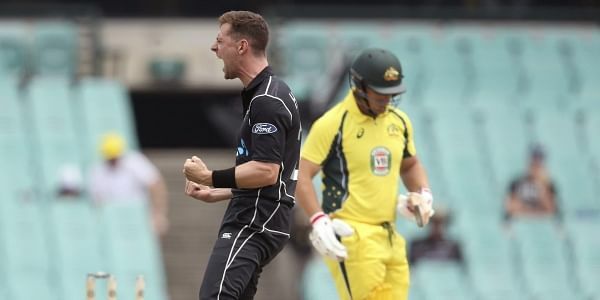 The New Zealanders, who thought their win was secured with Australia at 67-6, began to dissolve into panic as Stoinis kept up his lone assault. He reached his half century with consecutive sixes off Mitchell Santner and his century — from 96 balls — with a six off Trent Boult. But he was also dropped on 91 by Williamson and should have been run out on 127 by the New Zealand captain. "Obviously we had a great start with the ball and then to watch the way Marcus played for a good part of 35 overs was amazing," Williamson said. "It was a fantastic knock and certainly deserves man of the match. "It was a great game of cricket and nice to be involved in a game like this." New Zealand's replacement wicketkeeper Tom Latham claimed five dismissals — three catches and two stumpings — to match the New Zealand one-day record held by Brendon McCullum, Adam Parore and Gareth Hopkins as Australia's top order unraveled. New Zealand was put in to bat by Aaron Finch, who became Australia's stand-in captain when Matthew Wade, initially named to stand in for the injured Steve Smith, was in turn ruled out when he strained his back in training. New Zealand's innings was book-ended by Martin Guptill's 61 and Neil Broom's 73 but the failure of its middle order, largely due to Stoinis' 3-49, limited its total and made the match seem closely balanced at its midway point. Finch called the match an emotional rollercoaster. "That was one of the great one-day innings and probably one of the great allround performances," he said. "Marcus bowled brilliantly, struck the ball unbelievably but we just couldn't get over the line unfortunately."